Now under the ownership of Mark & Josie Solomon. Mark is a fully qualified chef, and star of Yorkshire TV’s ‘Making The Most Of’ – an ethnic cooking programme, hosted by Christopher Lillicrap. At the Kenley we have created a warm and relaxed environment for our Guests to enjoy. The Kenley is a 7 en-suite bedroom Guest House (plus one ground floor easy access suite, with wet room). 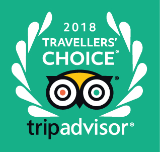 Travellers choice awards courtesy of TripAdvisor in 2012, 2013, 2014, 2015, 2016, 2017, and 2018. We are only a stone’s throw away from the promenade. Being ideally situated between the Pleasure Beach and the Blackpool Tower, we are in a prime location for our Guests to enjoy the sights of Blackpool with relative ease. We are fortunate in that the tram and local buses have passenger boarding points at the bottom of St Chads Road whilst Locating The Kenley is also made easy as we are only 5 minutes drive away from the M55. After a busy day enjoying the sights and attractions which Blackpool has to offer, you are invited to relax and unwind in the comfort of our lounge where you can share experiences with your fellow guests or simply sit back and take in the atmosphere. With a fully licensed Bar we can cater for most of our guests preferences and generally find that we have something for everyone in house. At the end of the day enjoy a comfortable and relaxing night’s sleep in our newly refurbished rooms with memory foam beds. Our bedrooms are modern, stylish, and above all comfortable. We cater for the modern day demands of our guests. All rooms are en-suite, have full central heating, freeview television (some have Smart / HD TV) and beverage making facilities. Enjoy a complimentary breakfast in our modern style Dining room which can be comfortably arranged to suit our guest’s needs and which prides itself in offering a choice of breakfast menu where the first class cuisine has inspired many a return visit from previous guests, where possible we will endeavour to cater for any dietary preferences our Guests may have. We now welcome babies and young children. Cots are provided. 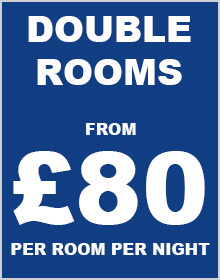 Please ask about our special Ground Floor Double Room for people with walking difficulties. Car Parking – we have our own private car park at the back of the hotel. These spaces are limited and charged at £8.00 per day. The car park is gated and has CCTV. Please book your space when booking your room. You will receive an Authorisation Number. Please quote this on arrival. Filtered Water – after the shock of the Blue Planet 2 documentary, and the current move by large catering outlets/stores to cut-down on the use of plastic, we’ve now stopped serving bottled water in plastic bottles. We now serve our own carbon-filtered fresh water in glass bottles. Available in all of the bedrooms for you to enjoy. Also available in our dining room. Glass Bottles – we no longer buy milk in plastic bottles, we have it delivered in traditional glass bottles. Yes, back to the old days of a pint-a-milk and orange juice in glass milk bottles. Delivered to our hotel doorstep fresh every morning! – We now welcome children from cradle upwards — cots and blankets provided. – One of the first things we did was remove the vavcancy/no vacancy sign and immediately stopped taking business that knocked on the door for a bed for the night. You now have to pre-book at the Kenley, this is for the extra-security of our residents. – We built an easy-access room on the ground floor for folk struggling with the stairs. – We rebuilt the kitchen and equipped it with the finest and most modern cooking suite. – We have our own car park for 6 cars — gated and equipped with CCTV for your car’s security. Note there is a charge for this service. – We have just finished building our own in-house, bespoke laundry service for our guest’s convenience. Give us your dirty washing in the morning and get it back freshly washed and ironed by lunchtime. There is a charge for this service. – We make & bake our own bread in-house and it’s always served at breakfast. As Mark is a fully qualified chef, the food and hygiene is second to none, not only can we boast of extremely high-ratings on TripAdvisor, our hygiene rating by Blackpool Council is the highest one can achieve. BETWEEN 2.00PM AND 7.00PM ONLY. AFTER 7.00PM BY SPECIAL ARRANGEMENT ONLY. IF YOU ARE STUCK IN TRAFFIC MAKE SURE YOU HAVE CALLED TO ADVISE US OF YOUR SITUATION NO LATER THAN 6.00PM.